Reading Progress Update: I've read 32 out of 227 pages. Finally, a book that satisfies my craving for Science Fiction! I don't want to raise my hopes up yet but so far, I'm already loving it! I've had this book since last year and I don't know why I haven't read it yet. Thank goodness I finally had the sense to do so. 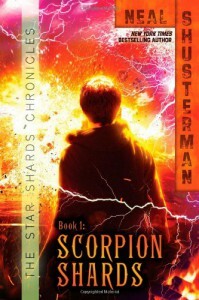 I'm quite impressed with Shusterman's writing style, very rich and sensible. And the characters...oohhh...somehow I can already sense my oncoming love for them. I might finish it today and post up a review tomorrow.